Moses parted the Red Sea. Yoav Rosen simply wanted to walk on water. So he did. Sort of. In the Book of Matthew, Chapter 14, we read of Jesus' followers, the disciples, caught in rough seas. "But the ship was now in the midst of the sea, tossed with waves. . . . And in the fourth watch of the night Jesus went unto them, walking on the sea." Christianity is not the only religion to embrace the act of walking on water. In Buddhism, Sariputta crossed a tumultuous river to hear the great Buddha preach: " `This stream shall not prevent me. I shall go and see the Blessed One,' and he stepped upon the water which was as firm under his feet as a slab of granite." Hinduism also touches on this spectacle. In Judaism, Moses felt no need to stroll atop the surface. He simply parted the Red Sea. Then there was that mere mortal, Leonardo da Vinci, who once contended that "the knowledge of all things is possible." Before Galileo, da Vinci suggested that "a large magnifying lens" should be used to study the surface of the moon. And 525 years before Yoav Rosen came calling on me, da Vinci created a drawing in his Codex Atlanticus that shows a man atop two floats, poles in hand, attempting to walk on water. It was October 2001 when Rosen first phoned and told me in his Israeli accent that he could walk on water. I thought it was another lunatic who believed he was Jesus. Rosen explained he had discovered my book, Outside Magazine's Adventure Guide to New England, which explores everything from hiking to hang gliding and dog sledding. He must have figured that if anyone were crazy enough to try his new toy, it would be someone like me. He had moved to Boston earlier that year so his wife could work at Dana-Farber Cancer Institute. In Israel, Rosen had been marketing director for a software company, but the faltering economy here had him scrambling for a job. Taking special notice of the Charles River and the ponds near his new home in Newton, he became obsessed with a childhood dream. Not for spiritual reasons, but purely recreational, he'd always been fascinated with walking on water. He scoured patents on file with the United States Patent and Trademark Office, including the first water-walking apparatus, patent number 22,457, designed by Bostonian Henry R. Rowlands in 1858. Rowlands devised two pontoons or boats, one for each foot. You had to step, wait, step, wait, without fluid movement. Rosen set out to solve the propulsion problem. He assured me his design permitted steady motion. A flap opens and allows water through as your foot moves forward, then closes, resisting water as you push back. He insisted I try it, and since we both lived in Newton, I had to be game, right? Wrong. I wished him well and went for a bike ride. In February 2002, Rosen called again. "I have perfected the problem of stability," he announced. His solution was to shift the weight of the two "floaters" to the bottom and connect them with a cable. An hour later, we were standing at a bend in the partially iced-over Charles River. It was my first chance to eye this device; two styrofoam pontoons with holes for your feet, a cross between skis and small canoes. It looked bulky and awkward as Rosen planted his feet in position. His first steps reminded me of Frankenstein's initial attempt at walking. Yet he was quickly gliding along like a cross-country skier. Rosen stayed upright and asked if I'd like to give it a shot. I looked down at the frozen river; I passed. Rosen e-mailed me occasional updates. He was a semifinalist in the MIT $50K Entrepreneurship Competition. He hoped to attract venture capital money, but only two firms seemed interested and both eventually declined. He sold shares of his company, WaveWalk, to family and friends at $15 each. The money was essential for research and development and for the patent, which can run to $20,000 just for the US territory. Sunday, August 3, 2003, my family is enjoying the shade trees of Auburndale Park on the banks of the Charles when I glance out at the water and notice a familiar man standing, paddling a yellow contraption that looks like a large rocking chair. It's the first time I've seen Rosen since that chilly morning a year and a half ago. I had assumed he went bankrupt. "What is this?" I ask him. "The latest and greatest. The W boat," he says, grinning. The styrofoam has been replaced by a slick polyethylene. Rosen has abandoned walking on water and entered the arena of paddle sports, using more of his savings (closing in on $100,000) to create an aluminum mold used in the manufacture of the product. His floaters have evolved into a double-hull boat, not unlike a catamaran. In the open center is a fore-to-aft seat between the hulls. He has left space on either side of the seat so the boater can stand to paddle or fish. This time, I hop on and begin to stroke. I am startled by the ease of navigating and the quickness of the boat. 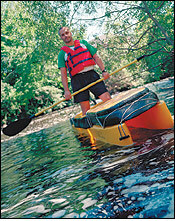 Then I bolt upright, hesitant, recalling that the last time I stood inside a paddle boat -- a canoe -- it capsized. But this craft cannot be toppled. My 4-year-old joins me and shoots for the opposite shore with the grace of a Maine river guide. This summer, 18 boat stores in New England began selling the craft for $840, at a time when canoe sales have been down for years and kayak sales seem to have peaked. Rosen, 43, hopes to license his design to manufacturers so that high-end kayak companies can create an upscale version of the W boat while an affordable alternative is available to amateur paddlers. "But what about walking on water?" I ask Rosen back on shore. "And the ability to use your legs to travel?" "You still use your legs, to stand," he says. "It's a hybrid." He laughs. A former chemical engineer, Stephen Jermanok changed careers himself, to follow his boyhood dream to write.